Sunday 6th March 2016 marked a historic occasion for world table tennis as China successfully captured record-breaking 20th gold medals in both the Men’s Team and Women’s Team competitions on the concluding day of the Perfect 2016 World Team Table Tennis Championships in the Malaysian capital of Kuala Lumpur. In both gold medal contests Team China faced opposition from Japan with both matches being decided by 3-0 score-lines: Liu Shiwen, Ding Ning and the now retired Li Xiaoxia produced a convincing display for the top seeds in the Women’s Team final before the line-up of Xu Xin, Ma Long and Zhang Jike completed the double for China by securing the Men’s Team title. 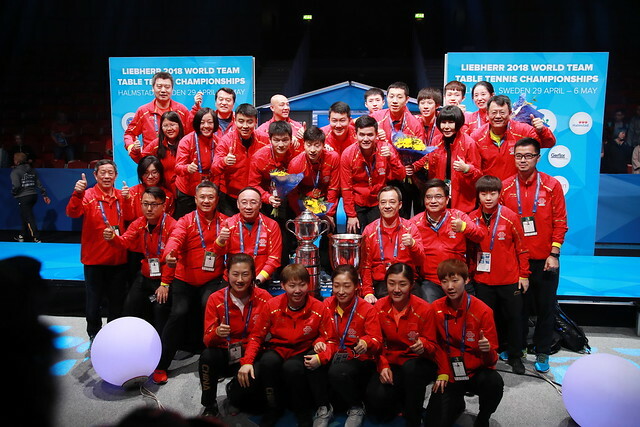 Victory in Kuala Lumpur saw China become World Team champions in the Men’s Team category for the eighth consecutive occasion while the country’s female contingent claimed an 11th title since 1993. China’s first title in the Men’s Team event was won on home soil in 1961 when the World Team Championships were held in Beijing and became Women’s Team champions for the first time four years later at the 1965 tournament held in Ljubljana, Slovenia. Once again the favourites for success, will it be gold medal no.21 for the two Chinese teams in Halmstad? Be a part of the action, reserve your tickets for the Liebherr 2018 World Team Table Tennis Championships here.